Little kids are just as excited about Prince George as the rest of us. 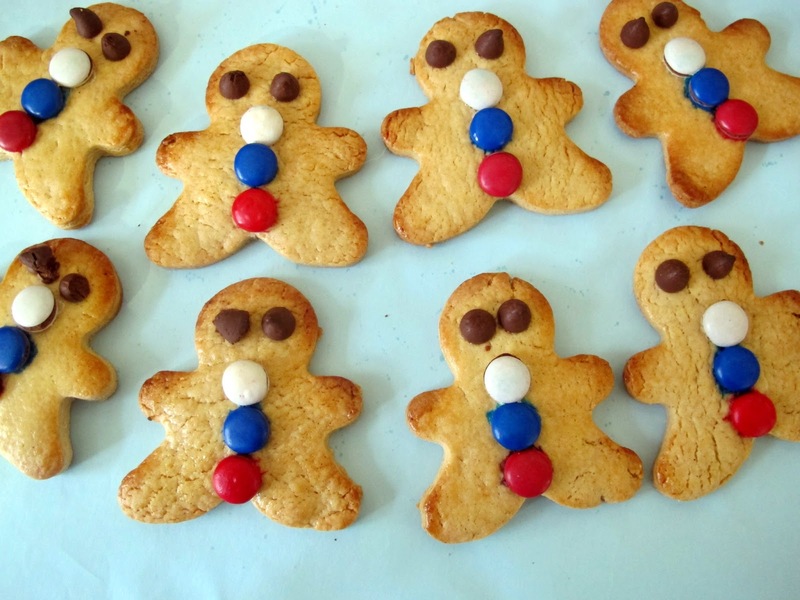 So why not have fun baking with them and creating these royal gingerbread babies with red, white and blue Smarties buttons. Older kids may like to add more detail with royal icing. Susie baked this batch and then spent the rest of the afternoon helping the littlies make theirs. The dough is not too sweet and it is sturdy. Brushing the gingerbread babies with a sweetened condensed glaze not only made them shiny and brown but also helped the Smarties and Choc bits to stick. I found the basic gingerbread recipe in a supermarket leaflet and have given it a royal twist. 2. Melt the butter, brown sugar and Highlander Sweetened Condensed milk in a saucepan. 3. Whisk in egg and spices. 4. Sift flour and baking powder together in a large bowl. Stir into the mixture. 5. Divide in half. Wrap both pieces in plastic wrap. 6. Refrigerate for 10-15 minutes. 7. Roll out each piece to 5mm in thickness between 2 sheets of glad wrap. Peel off the top sheet of glad wrap. 8. Using a biscuit cutter cut out the gingerbread shapes and place on baking paper lined oven trays. 9. Mix the extra Highlander Sweetened Condensed Milk with the water. Use a pastry brush to spread this over the top of the biscuits. 10. Decorate them with red, white and blue Smarties and Choc bits. Press these down firmly into the dough to help them to stick on. 11. Bake in preheated oven, one tray at a time, for 12-15 minutes or until the royal gingerbread babies are golden brown. 12. Leave them on a tray for 5 minutes, and then lay gently on a rack to cool.